Captain (N) Robert James Deluca, OMM, SSM, CD3 – age 81of Halifax. Born in Toronto, August 5, 1936, he passed away Saturday January 27, 2018 in the QEII Health Sciences Centre – Halifax Infirmary. He was predeceased by his wife Marion (nee Johnston). He will be greatly missed by his daughters Catherine (Vancouver) and grandchildren Maxim and Nicole; Cheryl (Steven) Masters (Halifax) and grandson Alexander; and Diane (Connecticut). Robert is survived by his sister-in-law Joann Scott, sister Marjorie Hind (Toronto) and his brother George (Burlington, ON). He was pre-deceased by his parents James and Marjorie Deluca and his brother Frank (Toronto). His Royal Canadian Naval career spanned from his enrollment as a Seaman Electrician in 1954 to his retirement as a Captain (N) in 2001. He was selected for commissioning and graduated from the venture Officer Training Plan in 1957. He navigated HMCS QUINTE & IROQUOIS; and was the Operations Officer of HMCS ATHABASKAN and INCH ARRAN. After graduating as a specialist in Naval Operations he was Operations Officer of HMCS RESTIGOUCHE and the OIC of the Tactical Information Section of the Fleet School Halifax. He is an Honours graduate of the CF Staff College. 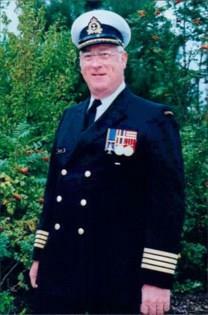 Robert was the Commanding Officer of the destroyers HMCS MACKENZIE, RESTIGOUCHE and HURON. He also served in NDHQ Ottawa and on the staff of NATO HQ, Brussels. He was appointed by the Governor-General as Officer of the Order of Military Merit in 1985. He held staff positions in Personnel and Plans at Maritime HQ Halifax until his retirement from the Regular Force in 1991. He continued to serve as Convoy Commodore to the Admiral with Primary Naval Reserve until 2001 for which he received a Maritime Commander’s Commendation, completing 47 years of continuous service to the Queen and Canada. On retirement, he pursued his hobby of photography, and is a Past-President of the Photographic Guild of Nova Scotia. Cremation has taken place. Visitation will take place on Friday February 2 from 3-6 PM and Memorial Service will take place on Saturday February 3 at 10:00 AM, both to take place at J.A. Snow Funeral Home, 339 Lacewood Drive, Halifax. Interment to take place at Fairview Lawn Cemetery Columbarium. On completion friends are invited to meet with the family at Royal Artillery Park, Halifax. and the hundreds of young officers who trained there.